Lovers of seafood rejoice! Ireland’s miles and miles of Atlantic coastline means that the seafood is not to be missed. Lovers of seafood rejoice! Ireland’s miles and miles of Atlantic coastline means that the seafood is not to be missed. The Irish love their seafood so much that they regularly celebrate its excellence at foodie events around the country. So should you want to taste the best of the best, we suggest you attend! There’s the Galway Oyster Festival where you can sample the freshest, plumpest oysters, native to Ireland’s west coast. If huge bowls of mussels make your heart sing, you’ll have to schedule a trip to the Connemara Mussel Festival, which takes place in April. Should it be giant prawns that rev your foodie engine, you’ll have to check out the Dublin Bay Prawn Festival also taking place in April. Another seafood delight that the Irish take seriously is chowder. So seriously in fact, that each year an All-Ireland Chowder Champion is crowned in Kinsale. Finally, one last excellent place to try Irish seafood is the Burren Slow Food Festival, which celebrates all the delicious food that the seas and lands of Ireland produce. 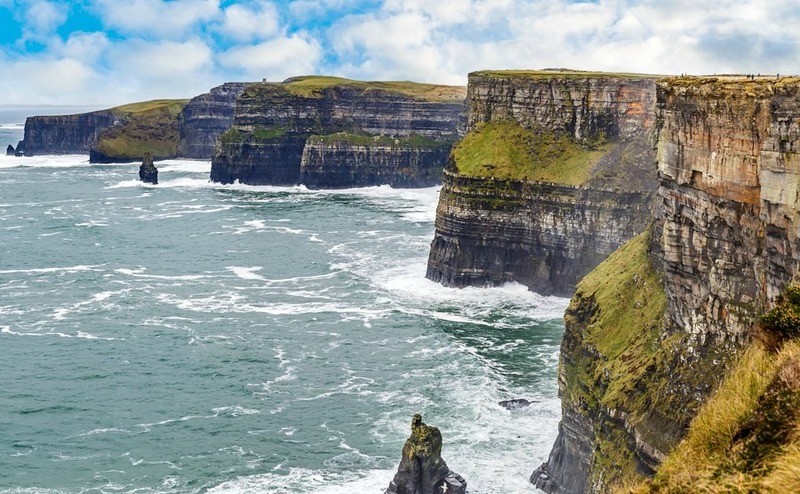 Expect excellent speakers, a champagne picnic under the Cliffs of Moher, and as a finale, a slow-cooked banquet made with the area’s finest local produce. Imagine dining upon a feast of Ireland’s freshest produce all against the stunning backdrop of the Cliffs of Moher. No matter what dining table you find yourself sat around in Ireland, you can expect to be offered soda bread – and more often than not, it will be made to a specific family recipe. Some soda bread will be laced with treacle or Guinness to make it particularly decadent, where others might take a more healthy approach and add oats, seeds, and honey. Aside from these embellishments, the staple ingredients of soda bread remain the same: bicarbonate of soda and buttermilk. Enjoy your soda bread loaded with liberally-spread Irish butter. Strictly speaking, it’s not food, but we all know that a pint or two of Guinness is wonderfully filling, plus mentioning Irish staples without mentioning Guinness is completely unforgiveable! Although traditionally always made with mutton, nowadays lamb is easier to come by. The meat is slowly stewed for many hours alongside potatoes, onions, herbs and stock, and usually comes served with slabs of the soda bread we’ve already mentioned. The Irish like their grub hearty, and this dish of cabbage and boiled bacon is no exception. Traditionally the bacon will be a salted pork shoulder, which will have been soaked overnight before being boiled. The cabbage is added in at the last minute, and the dish is usually served with a parsley sauce as an accompaniment. Potatoes became a staple in the Irish diet after they were introduced to the country from the New World in the latter part of the 16th century. Following their introduction, the Irish population boomed, fuelled by potatoes! Sadly, this boom ended in the 19th century when the potato harvest was ruined and many thousands perished. Despite the chequered history around this vegetable, colcannon is a classic potato mash made with butter or cream, flavoured with spring onions, and often served with kale or cabbage. Another potato equivalent is champ, a simple mash flavoured with milk, butter and spring onions. 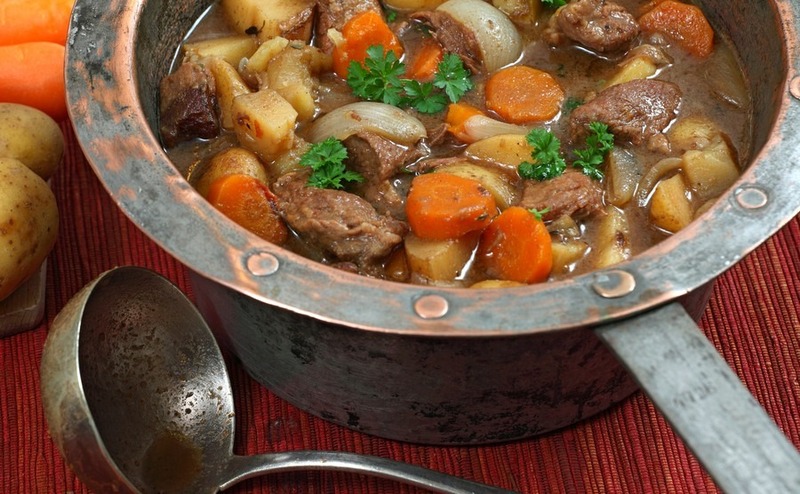 With dishes like Irish stew and colcannon, it’s safe to say the Irish know a thing or two about hearty comfort food. Coddle is yet another one-pot stew, which hails from the homes of working class Dubliners, and involves taking all of the leftovers from the week, and slowly stewing them in the oven. Alongside potatoes and onions, coddle often features leftover bacon, or ham. Nowadays, if you spot coddle on a menu, it’ll likely have been jazzed up a little, and might come with finely made sausages, and bacon. Don’t forget to have your soda bread on hand to mop up the dish’s nutritious juices. Just when you thought it wasn’t possible to find another use for potatoes, along comes boxty. This potato-y dish combines grated raw potato mixed with mashed potatoes that are then salted and floured before being sliced up and fried in butter. This potato cake is just delicious when topped with poached eggs, smoked salmon, or just about anything really! Now for something to satisfy that sweet tooth – Barmbrack is a fruity loaf, served all year round, that comes smothered in butter and with a side helping of Barry’s Tea! Put simply, this is just your standard fruit cake, filled with raisins, candied peel, and mixed spices, but some recipes call for it to be soaked overnight in tea and whiskey! Anyone moving to Dublin that professes to have a sweet tooth must make sampling gur cake their first port of call. Between two thin layers of pastry you’ll find a thick, tasty paste made of cake crumbs and dried fruit. Traditionally gur cake has been a favourite of the working classes, given the fact it’s made from the leftover items in Dublin’s bakeries and is therefore nice and cheap. We know – it all sounds delicious, doesn’t it! Should this motivate you to make 2017 the year you move to a place where hearty, fresh fare becomes part of your everyday, call our Resource Team today on 020 7898 0549 to talk through the steps involved in a move to Ireland. 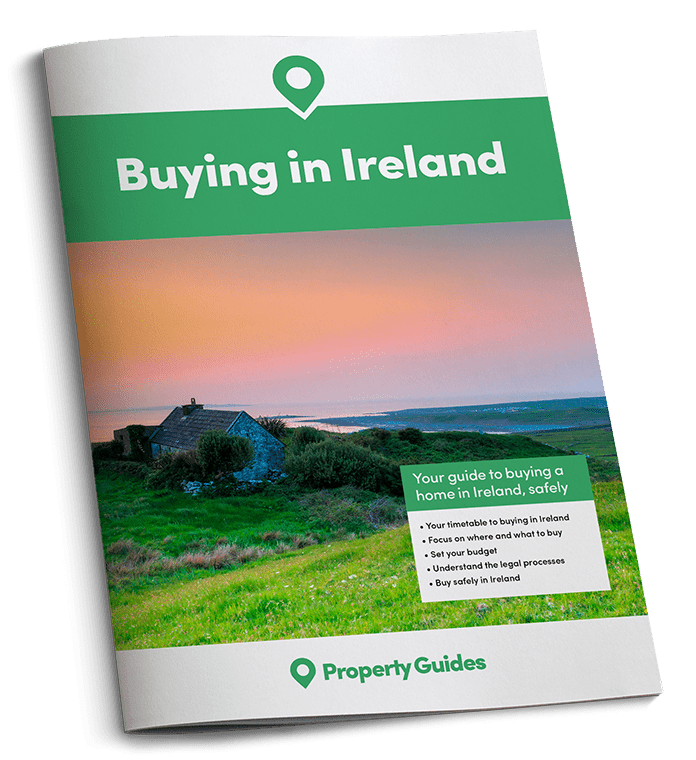 What’s next for the Irish property market in 2019? ‘Brexodus’: are Britons leaving the UK for Ireland over Brexit?